The "incremental update" for the PC version of Fallout: New Vegas that was promised last week is now available on Steam. 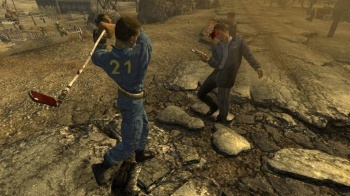 Fallout: New Vegas was a buggy mess when it came out back in October, suffering from issues ranging from the creepy but relatively harmless "Exorcist twist" all the way up to far-too-common show-stopper crashes. Bethesda promised to put out patches "as quickly as possible" just a day after the game launched and revealed yesterday that a big, "comprehensive" patch is in the works for all three platforms and should be out in the next few weeks. While we wait for that to happen, PC gamers can get a little bit of relief thanks to the 1.1.1 update that's now available on Steam. - Fix: Severe performance issues with DirectX. - Fix for varmint night scope effect persisting in kill cam. It's kind of amazing, given the length of that list, that this is just a patch and not the patch. It also makes me happy that I decided to wait to play this thing until the worst of the bugs were squashed.